Cleaning windows requires a number of tools which are essential in order to achieve that streak-free, glistening clean finish. 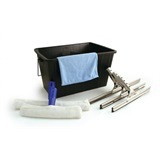 For any cleaning or janitorial staff working either domestically or commercially, the correct window cleaning kit is always going to offer exceptional results. Combining products such as water buckets for the mixing of water and cleaning liquids, window washer applicators for deploying cleaning agents to the surface areas, micro fibre cloths, and squeegees - you will never be without adequate kit. We stock a range of all the aforementioned products, alongside a selection of purposed cleaning kits and chemicals to help you achieve those crystal clear windows.